Put Your Heart On Paper is filled with the inspiring true stories of what happens when people write from their hearts: the shared insights, the new beginnings, the dreams that miraculously come true. 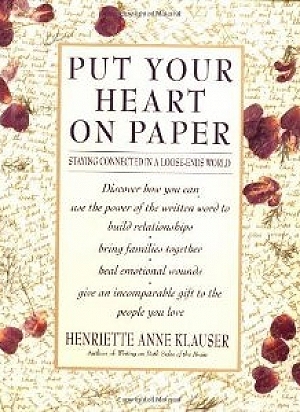 In 50 provocative short chapters, acclaimed author Henriette Anne Klauser shows the power of the written word in everyday life: bringing together parents and children, strengthening personal bonds, mending hurt feelings, solving problems, sharing joys, and preserving family history. Putting your heart on paper does not require special talent, a lot of time or training. All you need is a willingness to be yourself and to be open with others. Klauser offers tools and tips to get you started and help you persist beyond the fear and doubt with dozens of ideas to try. From a note tucked in a lunchbox to an interactive journal, from love letters to apologies to a three-minute poem, Put Your Heart On Paper shows us how to find a direct line from our deepest thoughts to another's heart. Especially for families, or anyone who wants to know how to deepen relationships or brighten the world you live in. Put Your Heart on Paper is in its 9th printing. This is perhaps the most personal of my books. It is a family-oriented book. There are many examples in here of writing with children, and celebrating life's big times (graduation, landmark birthdays, weddings) and little times, too. If you want to know me, and to know my own family, this is the book that tells our story. But it is not about us--it is about you, and ways that you can, as the cover promises, "use the power of the written word to build relationships, heal emotional wounds, and give an incomparable gift to the people you love." "Both practical and pleasurable, this latest by the author of Writing on Both Sides of the Brain offers writers and non-writers alike writing exercises for getting and staying connected with the people in their lives: family, friends, themselves, and even strangers. Drawing in large part on her own experiences, Klauser uses anecdotes--many quite moving and inspiring--to illustrate the uses and explain the origins of her suggested writing projects. The volume works well as a source book; its copious exercises and examples make it one of the best available. Klauser describes this as "not a 'how-to' book but a 'why bother' book." In keeping with this philosophy, most of the exercises are easily adaptable to different settings, such as classrooms or therapy sessions, where "why bother" is always a lively question. At the same time, the exercises provide sufficient structure, encouragement and impetus for hesitant writers. In her reflective segues, she explores the differences between writing and speaking, times when writing serves better than conversing, and ways in which writing connects not only people, but past and future to the present moment. Klauser is clearly comfortable writing about writing, and idealistic about its personal, interpersonal, and community-wide benefits."